Safran’s Joint Fires Support System (JFSS) was designed with flexibility in mind, with the French company offering three variants depending on user needs. The JFSS was produced in response to the growing importance of Digital Aided Close Air Support (DACAS), “a pivotal part of operations for NATO countries”, according to the company. Units on the ground deploy Intelligence, Surveillance, Target Acquisition & Reconnaissance (ISTAR) resources that need to be integrated into the command chain while allowing interoperability between different services and among allies, demands that led to the development of JFSS. The JFSS family are made up of a precision inertial North seeker and electro-optical equipment produced by the company, Safran states. 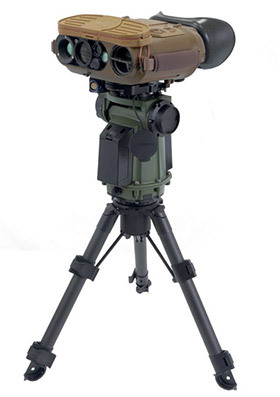 It also comprises a laser designator – or marker – a Geographic Information System and a radio. “Depending on the mission, various electro-optical equipment can be chosen by the user, including in particular Safran products such as the PLRF rangefinder and Moskito or JIM binoculars in various versions,” the company states. JFSS is available in three variants, a Safran spokesperson told Soldier Modernisation. The day-time version comprises the Sterna target location system and the PLRF25C pocket laser range finder. “It has an ultralight weight of 3.2kg and a direct view,” the spokesperson added. There are two ‘anytime’ versions of JFSS. The first is made up of Sterna and the Moskito TI lightweight multi-purpose target locator. The spokesperson said it was lightweight – at 3.8 km – and “is multispectral and has a multimedia and digital connectivity”. The second ‘anytime’ variant is formed of Sterna and the JIM Compact. This is a long-range version, said the spokesperson. It has a weight of 4.8kg, is multispectral, and has a multimedia and digital connectivity. As the battlefield becomes more integrated, increasing demands are placed on systems like JFSS. The spokesperson said that Safran addressed such demands through ensuring the system is highly interoperable, capable of interlinking with the command, control, communications, computers and intelligence (C4I) systems used by militaries. Safran states that the JFSS is a flexible system that can be tailored to the needs of the user. The company says it provides the lightest system on the market, a modular product line that can move from direct view to multispectral digital connectivity. The precision of such systems is crucial, in order to avoid ‘blue on blue’ engagements. As such, the JFSS is Target Location Error (TLE) CAT1 out to 4.5 km. In addition, it provides minimised set-up time and “fully trustable coordinates”, according to the company. Safran’s systems like the Sterna and its GonioLight pointers have proven popular on the market, the spokesperson said.